According to the Insurance Institute for Business and Home Safety, a ruptured water tank is one of the top five causes of residential water damage. These incidents cost an average of $4,444 after the deductible is paid. A ruptured water heater may not be one of your top concerns, but it is actually one of the most common types of system failure. Is your water heater at risk of bursting? Here are three things that could cause your water heater to burst. Over time, minerals from hard water build up and settle in the bottom of your water heater tank. This sediment insulates the water from the burner or heating element, forcing it to work harder to heat the water. This often results in overheating that can deteriorate the tank. If your water heater makes a knocking or popping sound, you have a sediment problem. Prevent this issue from draining and flushing the tank annually. Conventional water heater tanks are made of steel, and steel eventually rusts. While water heaters feature a sacrificial anode rod that helps protect the system from rust, these rods eventually deteriorate. When that happens, the tank starts to rust soon after. If your hot water has a brownish tint, the tank is likely rusting on the inside. Pay attention to the anode rod, and replace it if it becomes too worn down. Inspect the tank regularly for external rust, and look for small leaks that could indicate pinholes. If too much pressure builds up inside your water heater, it will eventually burst. Water heaters feature a temperature and pressure relief valve, but over the years, the pressure can still wear down your tank. If the T&P valve frequently opens or starts leaking, you likely have a pressure problem. Pressure tends to build when the temperature is set too high, so make sure your water heater is only set to 120 – 125 degrees. 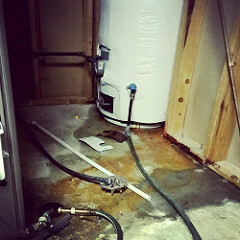 A burst water tank is a plumbing nightmare that no homeowner wants to face. Since most people don’t give their water heaters much though, though, it’s a fairly common problem. If you need a new water heater in Hagerstown, Larry & Sons can help. Contact us today.